First of all I would like to congratulate you for your kind stuff for the Sindhi society. Sir, I am working on World’s Largest Sindhi Cultural Portal on the CyberSpace. 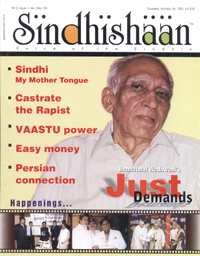 This is the website on which everything concern to the word “Sindh” and ‘Sindhi” will be available. Sir, I need some content of your site to be share on my site. For this I also publish the links and rights of your site after each topic. Some of the data will also be translated and published in Sindhi language also. I will be very thankful to you if you kindly pay some attention to my application.